New plug-ins that sound gopd enough to eat. There's a bit of a food theme to our latest round-up, as we bring together a pancake, a flan and something with a bit of crunch. Before you pick up your knife and fork, though, allow us to reassure you that the aforementioned products are designed to fill up your plug-in folder rather than your stomach. This creative tool enables you to create complex pan modulations and gives you the ability to draw your own waveforms. The LFO can be set to free-run or sync to host, and version 2 adds a precise left/right channel volume display, LFO triggering via MIDI, a dry/wet control and a redesigned interface. This classic flanger effect has a stomp-style interface but is suitable for use on more than guitar parts. You can adjust the speed, depth and feedback of the effect. 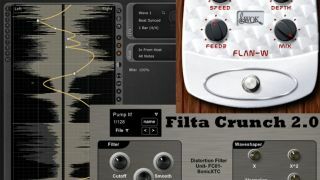 We first encountered Filta Crunch in 2012: it recreates the popular studio insert effects chain of filter (a Moog-style one, in this case), tube amp and waveshaper. Version 2 brings added presence, an improved filter and waveshaper enhancements.